This book kind of turned me into a jerk. I haven't encountered a book this compulsively readable in quite a while. And when I say compulsively readable, I mean exactly that. Every time I had a spare moment, I was cracking Yes Please open. Two minutes before we need to leave the house to meet friends? I can read a few pages. Thirty minutes after I promised I'd quit reading and turn off the light? Just let me finish this chapter. Twenty seconds into Adam's description of his work day? Maybe if I nod and occasionally throw in a “Hmm,” he won't notice I'm reading instead of listening. In short, I blame Amy Poehler for all my character flaws. I'm not even sure what exactly it was that pulled me in. Poehler states up front that she's not looking to dish on Hollywood gossip. She doesn't discuss the gritty personal details of her divorce. I'm a big fan of her work on Parks and Rec, but the chapter she devotes to the show is brief, with only minor glimpses behind the scenes. Plus there were some quirky little things that I didn't love—an oddly braggy chronicle of her drug use, for one, and a couple squirm-inducing claims of racism against white people (if it was a joke, it was a bad one, and didn't need to be included at all, let alone more than once). She also goes on a long, hackneyed rant about how much she hates technology and waxes poetic about the good old days before cell phones, a speech we've all heard so many times from people of her generation and older, it's getting hard to stay awake. Cell phones aren't the problem; if you're bad at balancing your life now, you were bad at it before Siri came along. Just one woman's opinion. Still, Poehler's conversational tone and badass confidence make for fun reading. I love how she's built the Leslie Knope character over the years on Parks and Rec, and it's always fascinating to take a peek behind the curtain of a celebrity's life. You won't get a ton of juicy tidbits, necessarily, but you will feel like you know Amy Poehler the person a little bit better. Much of the book reads like an advice column, which provides an interesting window into how her mind works, but whether or not you'd actually want to follow her advice might require some thought. 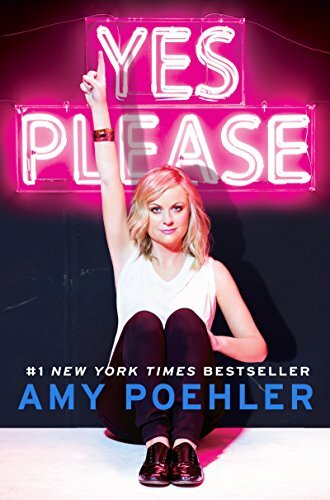 Yes Please is a perfectly light and fun read. It would be a good last-minute gift idea for your sassy grandmother. Or maybe you forgot to get something for confirmed bachelor Uncle Ed. Either way, Merry Christmas and Happy Holidays from Reading With Hippos. Are you a fan of Parks and Rec? Check out Adam's recommendation for Nick Offerman's book, Paddle Your Own Canoe!